Genetic counseling and BRCA1/BRCA2 genes testing are routinely offered in a clinical setting. However, no data are available on the proportion of breast cancer patients with a positive family history undergoing genetic counseling. 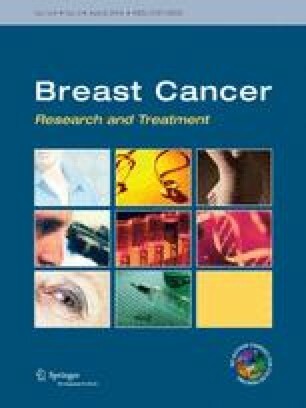 By linking databases of the Oncogenetics and Cancer Prevention Unit at the Geneva University Hospitals and the population-based Geneva Cancer Registry, we evaluated the uptake of genetic counseling among 1709 breast cancer patients with familial risk of breast cancer and the determinants of such a consultation process. We also studied the impact of genetic counseling on contralateral breast cancer occurrence and survival. Overall, 191 (11.2 %) breast cancer patients had genetic counseling; this proportion was 25.1 % within the high familial risk group. Recent period of diagnosis, early-onset breast cancer, female offspring, high familial risk, tumor size, and chemotherapy treatment were statistically significantly associated with genetic counseling uptake in multivariate analysis. More than 2 % of patients had developed contralateral metachronous breast cancer. An increased risk of contralateral breast cancer of borderline significance was found for patients who had genetic counseling versus those who had not (Cox model adjusted hazard ratio 2.2, 95 % confidence intervals 1.0–5.2, P = 0.063). Stratification by BRCA1/BRCA2 mutation status showed that the occurrence of contralateral breast cancer was 8-fold higher among mutation carriers compared with non-carriers. Age-adjusted overall survival and breast cancer-specific survival were not significantly different between patients who underwent genetic counseling and those who did not. In conclusion, we observed a significant increase in the use of genetic counseling over time and found that breast cancer patients with high familial risk had more often genetic counseling than those with moderate familial risk. A more thorough evaluation of sociodemographic and clinical predictors to attend the cancer genetic unit may help improving the use of genetic counseling services for at-risk individuals at a population level. Aurélie Ayme and Valeria Viassolo made an equal contribution to this study. Pierre O. Chappuis and Simone Benhamou jointly directed this work. This study was financially supported by grants KLS 02544-02-2010 and KLS 2946-02-2012 from the Swiss Cancer League. This investigation was also supported by a grant of the Geneva Cancer League and Fondation Dr. Henri Dubois-Ferrière Dinu Lipatti. The authors have no conflicts of interest and do not have any disclosures to declare.